The rent at Connolly Station Apartments ranges from $2,329 for a one bedroom to a $3,104 two bedroom. Apartments in this building are about as expensive as the Dublin average. This is a pet-friendly apartment. Connolly Station Apartments is an eight minute walk from the Blue-Sun Dublin/Pleasanton and the Blue-Wkd/Sat Daly City at the West Dublin/Pleasanton stop. This apartment is in Dublin. Nearby parks include Dublin Sports Grounds, Heritage Center and Mape Memorial Park. Connolly Station Apartments has a Walk Score of 61 out of 100. This location is Somewhat Walkable so some errands can be accomplished on foot. Experience a better kind of life at Connolly Station Apartments. Life at Connolly Station Apartments in Dublin, CA is your ticket to everything an apartment community should be. Intuitive, spacious layouts and convenient amenities like washer and dryers make our one-, two-, and three-bedroom apartment homes the perfect place to entertain or just kick back. On-site management and maintenance teams are available 24/7 to keep things running smoothly. If an enormous pool and sundeck don't get your blood flowing, then perhaps you'll feel more at home in the media room or clubhouse? The courtyard is the perfect place to take a break, and of course, you can't beat an on-site business center for those days when you don't want to go to the office on a Saturday. Parking? No problem! Stow your ride in its assigned spot in the garage. Our Dublin Apartments are pet-friendly, so be sure to bring Fluffy and Fido along! Situated in an incredibly walkable area, you will want for nothing when you live in these Dublin apartments. Pick up the essentials at nearby Safeway or Target, then head across the 580 to Stoneridge Shopping Center for food and fun at over 165 stores and restaurants. Get back to nature with a short walk to Mape Memorial Park and enjoy picnicking under the shade of exquisite trees, or head out a little farther to Dublin Hills Regional Park where you can find hiking trails and amazing views. Getting around Dublin and the rest of the East Bay is a breeze with a BART station close by and easy access to the 580/680 interchange. Though with so many opportunities right next door and within your building, who'd want to leave? Life at Connolly Station Apartments is truly a cut above the rest. So give us a call and schedule a tour so you can discover your new home at the Connolly Station Apartments in Dublin, CA. Looking for a home for sale in Dublin? Explore how far you can travel by car, bus, bike and foot from Connolly Station Apartments. View all Dublin apartments on a map. Search for homes in Dublin or find a Dublin real estate agent who knows walkable neighborhoods. Links will open on our partner site Redfin.com. 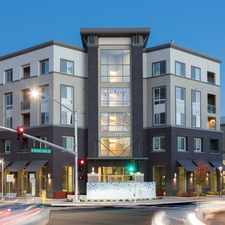 Connolly Station Apartments is in the city of Dublin, CA. Dublin has an average Walk Score of 34 and has 46,036 residents. Furnished Studio - Dublin - Hacienda Dr. Furnished Studio - Pleasanton - Chabot Dr.